Canada is in the midst of federal election campaigning in which three of the four political parties are telling us that our federal government must take serious action to reduce “carbon pollution” and promote a renewable energy economy. Their rhetoric is rife with misinformation; by “carbon” they actually mean carbon dioxide which is not a pollutant but a molecule essential to life on our planet. They promote the benefits of renewables but never mention the costs. The remaining political party is being ambivalent for fear of losing votes and upsetting the bureaucracy. Most of the popular media has fallen hook, line and sinker for the misinformation promulgated by the United Nations organizations thus the general public predominantly receives information based upon the political, economic and ideological abuse of science and the scientific method. The role of Friends of Science is to present empirical evidence that the sole focus on carbon dioxide as the control knob of climate is false and driven by a nefarious agenda. It is a daunting and difficult role to penetrate the pervasive misinformation but we are persistent in the knowledge that we speak the truth and honour the empirical evidence. We have an amazing team which is making substantial advances with meagre resources in communicating the truth to the public. We continue to need the participation of our membership, we could not make the progress which we have without your participation. There are a myriad of ways that the further participation of our membership could substantially increase our impact. Please contact us by phone, email or a meeting to share how you could become further involved in making our world a better place. I regret to inform you of the death of our former President, Len Maier, who passed away in Calgary on September 1st. Len was a dedicated and long-time supporter of Friends of Science. He was a rational environmentalist whose wisdom and contributions will be sorely missed. You can read his obituary online. As reported in Part 6 negotiators from members of the UN Framework Convention on Climate Change met in Bonn June 1-11 for ADP (Ad Hoc Working Group on the Durham Platform for Enhanced Action) session 2-9 which produced an 85-page negotiating text with 417 options. In preparation for ADP 2-10, the UN released in late July “A Non-Paper Illustrating Possible Elements of the Paris Package” that was prepared by the ADP co-chairs, Dan Reifsnyder of the US and Ahmed Djoghlaf of Algeria. This non-paper was still 83 pages in length, with most offering various options, including queries over the use of the words “should, shall or may.” It contains 98 references to a “governing body” which would presumably be charged with enforcing the agreement. It also discusses “ratification, acceptance, approval or accession” of the agreement. Obviously, ratification is out, because that would require approval by two-thirds of the US Senate. While the two co-chairs were preparing their non-paper, there was an informal ministerial consultation in Paris July 21-22 with 46 countries participating, to prepare for COP 21. One “breakthrough” (in the words of France’s chief climate diplomat) was a provision for five-year review cycles of emission-cutting pledges. The ministerial meeting also resulted in an aide- mémoire produced by France and Peru, five pages in length. It’s divided into four parts: general characteristics of the agreement; differentiation, ambition and next steps. One interesting provision is that the agreement will allow for “no backsliding or backtracking.” In other words, parties can only increase their previous levels of emission-reduction “ambition,” never weaken them. There was a second ministerial consultation September 6-7, with 57 participants dealing with finance. At the conclusion French President François Hollande warned of “risks of failure” at COP 21, saying, "There will be no agreement... if there is no firm commitment on finance.” By “finance” he meant the $100 billion/year promised at the Copenhagen climate summit. In the penultimate meeting before Paris, ADP 2-10 took place August 31 – September 4 in Bonn. As Climate News Network reported at the end of that session, “After a week of negotiations, they ended up with just a bunch of ideas and lots of unresolved obstacles.” The lack of any substantive documents on the ADP 2-10 webpage supports this conclusion. On the final day in Bonn delegates turned to the co-chairs for help in editing the unwieldy blueprint into a more manageable format, which they promised to have ready for the last ADP session (2-11) October 19-23. However, on September 4 in Bonn two blocs of countries (the US, Canada, Japan, New Zealand, Norway and Switzerland) and the China-G77 group submitted proposals to deal with “loss and damage,” a concept arising out of the 2013 climate summit in Warsaw. The resulting ADP working document notably omits any mention of “compensation.” Addressing the 46th Pacific Islands Forum Plenary Session, EU climate commissioner Miguel Arias Cañete assured his audience that, for the EU, adaptation and loss and damage is just as important as mitigation. Frustrated by the slow progress on the negotiating text, the UN Secretary-General plans to invite around 40 world leaders, including Barack Obama and Angela Merkel to a closed-door meeting on September 27, a day ahead of the UN General Assembly. France is helping to organize the meeting. In an effort to undermine President Obama’s negotiating position in Paris, Republican members of Congress are developing a strategy to frustrate any agreement. They’re planning two lines of attack. The first is to challenge the Environmental Protection Agency’s recently announced regulations for power plants, using the seldom-invoked Congressional Review Act while unleashing lawsuits to tie up the regulations in court for years. The second is to block the president’s $3 billion pledge to the Green Climate Fund, of which the first $500 million tranche risks being cut from the 2016 budget. India and a group of like-minded developing countries (China, Bolivia, Cuba, El Salvador, Ecuador, Iran, Nicaragua, Venezuela, Malaysia, Vietnam, Argentina and Saudi Arabia) are working on a common negotiating strategy for the October 19-23 meeting in Bonn, as well as in Paris. India and its LMDC allies have signaled that they will resist any "obligatory review mechanism" intended to increase their individual efforts to curb emissions. The UNFCCC will be unable to come up with a treaty-ready text by the start of the summit. There will be a standoff between President Obama and Congress over funding the Green Climate Fund, leaving the US in a weak position and putting the whole $100 billion/year GCF, as well as any Paris deal itself, in doubt. The EU (at least France and Germany) will try anything to avoid a debacle at the summit – anything except guaranteeing sufficient funding for the GCF. Moreover, Germany’s position has been weakened by the VW scandal (see next story). India and its allies will put their citizens’ welfare before any “save the planet” deal demanded by the US, the EU and their ENGO friends. Mindful of the finger pointing over its role at the Copenhagen summit in 2009, China will stay on the sidelines, leaving others to bear the blame for failure this time. While German Chancellor was preparing for the September 27 meeting at the UN, her lectures on environmental responsibility must have seemed a little hollow as Volkswagen’s emissions-cheating scandal broke. The chancellor had been straddling between pushing to reduce global warming while protecting her country’s auto industry – responsible for one in seven jobs and 20% of its exports. On September 18 the US Environmental Protection Agency issued a Notice of Violation to Volkswagen alleging that its diesel-engined cars contained “defeat devices” to turn on the full emission controls (against nitrogen oxides, or NOx, and particulates) only during testing. In normal operation the cars emitted up to 40 times the EPA standard. But, as articles in both Bloomberg and The Daily Mail make clear, the VW scandal involved more than just corporate cheating. It goes back to European governments’ “clean diesel” initiative, whereby they embarked on a drive to convert car fleets from gasoline to diesel, because the latter supposedly burn less fuel and therefore produce less CO2. So governments used generous tax preferences resulting in diesel models capturing more than half the EU market. In France, the leader, about 80% of motor fuel consumption is now diesel. However, reducing the NOx and particulates coming from diesels require expensive and inconvenient modifications to the cars exhaust system. Despite the modifications, smog caused by diesels has become a real health problem in both the UK and France. Moreover, as one study concluded, the diesel initiative “negatively affected” global warming. In other words, misguided climate politics by European policymakers got them the worst of both worlds. A report by the Stockholm Environment Institute claims that a UN carbon credit scheme “significantly undermined” efforts to tackle global warming and may have increased emissions by 600 million tonnes. In a random sample of 60 projects under the Kyoto Protocol and the Clean Development Mechanism, 73% of the offsets came from projects for which “additionality” was not plausible – that is, the projects would likely have proceeded even without carbon credit revenues. As a result of political horse-trading at UN negotiations on climate change, countries like Russia and the Ukraine were allowed to create carbon credits from activities like curbing coal waste fires, or restricting gas emissions from petroleum production. Under the UN scheme, called Joint Implementation, they then were able to sell those credits to the European Union's carbon market. Companies bought the offsets rather than making their own more expensive, emissions cuts. According to the review, the vast majority of the offset credits went into the European Union's flagship Emissions Trading Scheme. The authors estimate these may have undermined EU emissions reduction targets by 400 million tonnes of CO2, worth over $2 billion at current market prices. The author of a Watts Up With That article has a theory why carbon markets are so susceptible to fraud and sharp trading. In a normal market fraud damages the financial interests of at least some of the participants, so there is an incentive to report it to the authorities. In a carbon market most participants actually benefit from fraud. Sellers benefit by selling fraudulent credits because they are making money for nothing. Buyers benefit from a market flooding with fraudulent credits because the oversupply helps keep prices down. Dr. Roy Spencer analyzed 11 years of water vapour data from an instrument on the NOAA-18 satellite, and compared it to the mid-tropospheric temperature data satellite data. He computed monthly grid-point anomalies over the 11 year period, and calculated the water vapour change per temperature change. This gives information on how much the free troposphere moistens or dries when it changes temperature. The left panel of the following graph shows latitude band averages (60° N to 60° S) of the grid-point water vapour change per temperature change for the satellite measurements, while the right panel shows the same computations for 15 years (2006-2020) from a climate model. The three coloured lines represent different altitudes in the mid-troposphere. Note the enormous discrepancy between the observations and the climate model in the tropics about 25°N to 25°S. The climate model averages at about constant relative humidity, causing a positive feedback in both the tropics and exo-tropics. If relative humidity is constant, warming would cause an increase in water vapour, intensifying the greenhouse effect. The measurements show at all three altitudes in the tropics, water vapour declines with increasing temperature, indicating negative feedback, which reduces the direct effects of CO2. Spencer writes, "In rainfall systems, the amount of condensed cloud water that falls out as rain involves processes occurring on a tiny scale…the scale of cloud droplets and ice crystals. ... the models might not be accounting for increasing precipitation efficiency during warming, and in turn why the hotspot hasn’t developed… and why global warming in general is weaker than programmed into the climate models." See his article here. The goal of the Ocean2k Working Group is to place marine climate changes of the past century within the context of the previous two millennia. The group published a synthesis of 57 high-resolution ocean sediment series to represent ocean temperatures over the last 2,000 years. A co-author made an announcement of the study in Phys.org that claimed "Today, the Earth is warming about 20 times faster than it cooled during the past 1,800 years. ... This study truly highlights the profound effects we are having on our climate today. "Some news outlets announced the study with headlines lines “1,800 years of global ocean cooling halted by global warming”. Steve McIntyre of Climate Audit reviews the study here and here. He writes, "this newest proxy “Hockey Stick” ... didn’t actually show “the climate was warming about 20 times faster than it cooled during the past 1,800 years”. The graph above is FAQ Figure1 from the PAGES website here. The caption says in part "Results of the global sea surface temperature compilation from Ocean2k: A cooling over the past two millennium was reversed only in the most recent two centuries. Fifty-seven previously published and publicly available marine sea surface temperature reconstructions were combined and compiled into 200-year brackets, represented by the boxes." But only the surface thermometer temperature measurements are increasing rapidly in the 20th century, not the proxy data of the study. This is important because, as McIntyre says, "the divergence between the 20th century proxy data and 20th century instrumental data had been a major issue. ... The “problem” arising from divergence between a proxy reconstruction and instrumental temperature is that such divergence makes it impossible to have confidence in the proxy reconstructions in earlier periods without reconciling the divergence." In the last 200 years, some of the proxies go up and some down. McIntyre writes, "When McGregor originally published this series with decreasing SST, she was able to find a cloud in the silver lining, worrying that increasing strength of “offshore currents may be too strong for fish to swim against”, raising the spectre that scarce resources would have to be diverted to providing swimming lessons to impacted fish."! A paper Nieves et al 2015 was published in the journal Science shows that there was a "hiatus" of global surface warming in the 21st century, in stark contrast to a previous paper from Karl et al of NOAA which claimed to have "busted the pause in global warming." The NOAA paper adjusted the more accurate ocean temperatures from fixed and floating buoy data (not ARGO buoys) to match the much less accurate ocean temperatures from ship intake data. 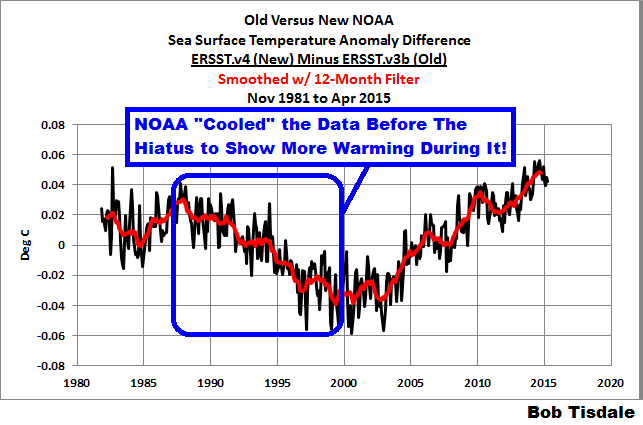 Bob Tisdale notes here that NOAA cooled the past from 1988 to 1999 to show more warming during the hiatus period 2000 - 2014, see graph here. He says, "NOAA’s new 'pause busting' sea surface temperature data still doubles the warming rate of the HadNMAT2 [Marine Air Temperature from the Hadley Centre, U.K.] data that served as the bias-adjustment reference for the new NOAA data." Other major government datasets have adopted the NOAA adjustments in time for the Paris IPCC conference in December 2015. ARGO data and the satellite data does not show a warming trend since 1998. Climatologist Dr. Judith Curry reviews the Nieves et al 2015 paper here. The paper's abstract here says in part, "We find that cooling in the top 100-meter layer of the Pacific Ocean was mainly compensated by warming in the 100- to 300-meter layer of the Indian and Pacific Oceans in the past decade since 2003." The paper say, "The global average surface temperature has been rising since 2003 by +0.001 °C/year. Although not zero, it is slower than the century time-scale warming of +0.0064 ± 0.0015 °C/year since 1880. The surface warming of the 2000s is also substantially slower than the 90s, which warmed at a rate of +0.008 °C/year." The natural cooling of the top 100 m of the Pacific ocean in the last 15 years suggest that much of the ocean warming from 1975 to 2000 was also natural, contrary to climate model assumptions. Judith was pleased that they used the accurate NOAA OI SST data set, available since 1985. This data uses satellite data to infill and correct ship observations to the more robust buoy measurements. Judith writes, "While the trend of 0.01 °C/decade since 2003 is over a different period, this trend value is starkly different from Karl et al. trend from 2000-2014 of 0.099 °C/decade." She also notes that "there doesn’t seem to be any observational evidence that Trenberth’s ‘missing heat’ is hiding below 700 m. Trenberth claimed to have found the ‘missing heat’ in the deep ocean from the ECMWF reanalyses [link]. Looks like this was an artifact of the analysis process." To accomplish our goal of educating the broader public and policy makers on the diversity of views on climate change, and the important natural factors, we need financial help from our members. Thank you for your help to date. This debate matters, you are making a difference.